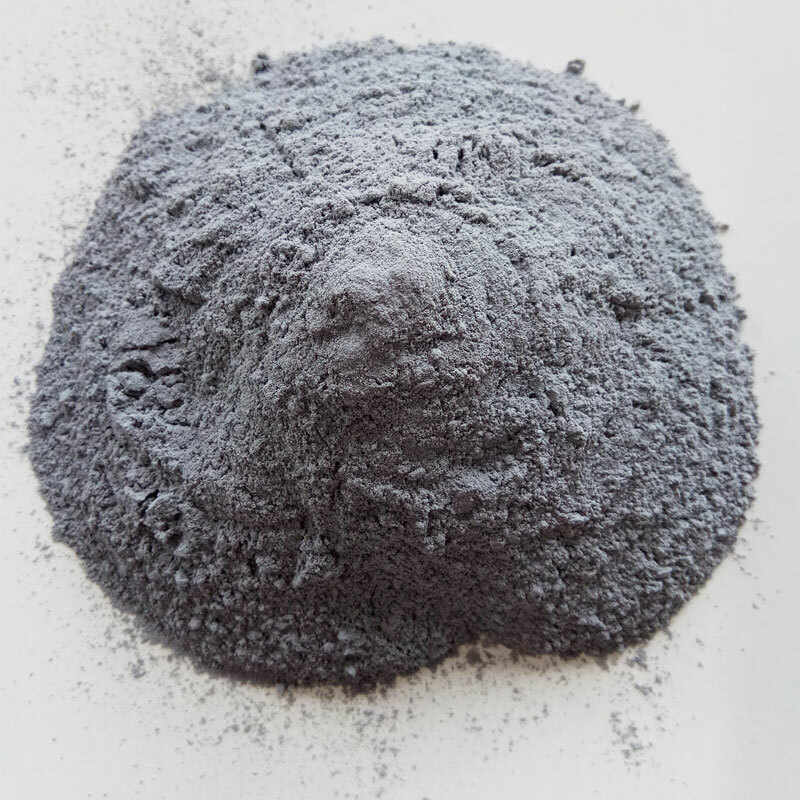 Microsilica is a byproduct from silicon metal or ferrosilicon industries, where these metals are produced in submerged electric arc furnaces. As the molten metal is produced, a silica-based gas is emitted. This gaseous fume, as it rises, cools rapidly and forms extremely minute,Amorphous, spherical particles. The micro silica fume is collected in a bag house, a system for filtering the hot air and gases vented from the furnace. The physical characteristics of microsilica are quite different than other concrete components. but the chemical make-up is rather similar. Microsilica is an extremely fine particulate, with average particle diameter is 0.2-0.3 μm , it is 100 times finer than cement particles. 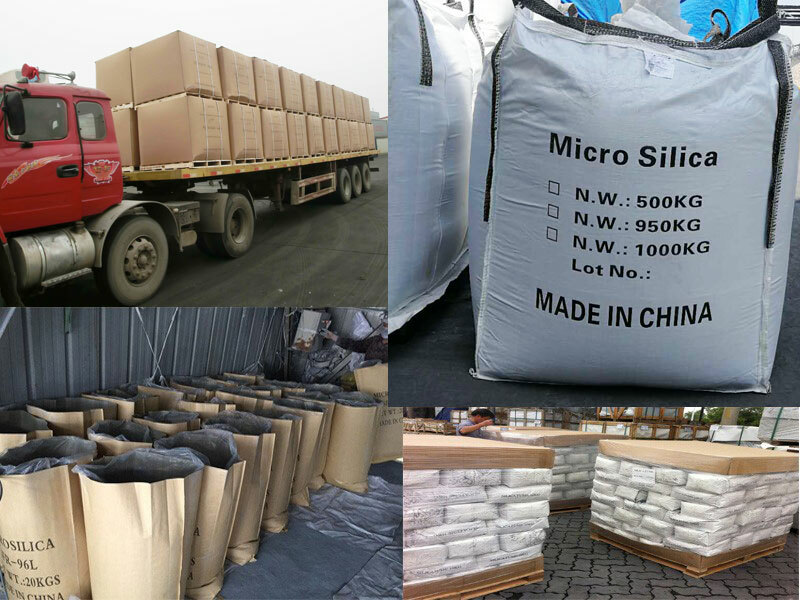 Specific gravities of micro silica are low, about 2.2, Because silica fume is an extremely fine material, its raw bulk densities are very low, varying from 300 to 600 kg/m3, after densified density will be 650 kg/m3 to save freight fee. Microsilica has been used as an addition to concrete up to 15 percent by weight of cement, although the normal proportion is 7 to 10 percent. With an addition of 15 percent, the potential exists for very strong, brittle concrete. It increases the water demand in a concrete mix; however, dosage rates of less than 5 percent will not typically require a water reducer. High replacement rates will require the use of a high range water reducer. 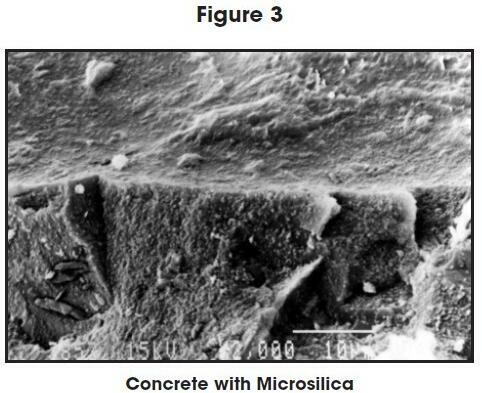 Microsilica improves concrete through two primary mechanisms — the basic pozzolanic reaction, and microfiller effect. The calcium silicate hydrate formed is the glue, or binder, which holds the system together. The weaker calcium hydroxide does not contribute as a binder, and can occupy as much as one quarter of the volume of the hydration products. Further, the calcium hydroxide can combine with carbon dioxide to form a soluble salt which will leach through the concrete, and can cause efflorescence, a familiar architectural problem. When high amounts of calcium hydroxide are present, concrete may be more vulnerable to sulphate attack, chemical attack, and adverse alkaliaggregate reactions. This additional glue improves bonding within the concrete matrix and helps reduce permeability, while the reduction in calcium hydroxide improves concrete durability. Figure 2 is magnified over two thousand times and highlights the aggregate-to-paste interface of a concrete matrix without microsilica. The top portion of the photo is a socket formerly occupied by the aggregate. Calcium hydroxide crystals are present underneath the interface, thereby preventing a good paste-(lower left corner)- to-aggregate bond. 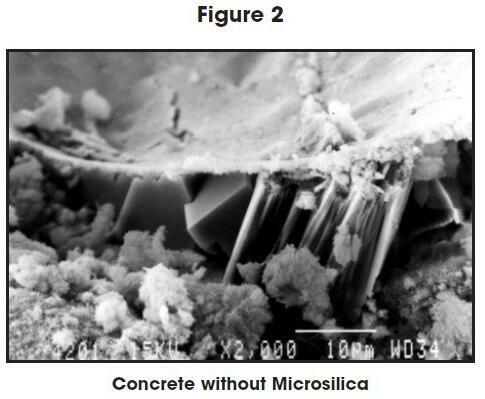 Conversely, Figure 3 shows a similar view with microsilica concrete. The top portion shows an aggregate socket with no calcium-hydroxide crystals beneath the interface. The paste forms an excellent bond to the aggregate, producing stronger concrete, and reducing permeability. The extreme fineness of microsilica allows it to fill the microscopic voids between cement particles. The microfiller effect is credited with greatly reducing permeability and improving the paste-to-aggregate bond of microsilica concrete compared to conventional concrete. Microsilica concrete is not difficult to work with, but because it is used for special applications, care should be taken to ensure that good quality concreting practices are followed. The water demand of concrete can increase when microsilica is added to the mix. Just as with aggregates, the smaller sized silica fume particles have an increased surface area, and thereby, increased water demand. One method of compensating for this effect is to increase the water content; however, this leads to a lower quality concrete. The use of a superplasticizer, or high-range water reducer, in conjunction with the micro silica is almost universally recommended. Depending on the dosage of micro silica fume, the fresh concrete may be more cohesive and sticky than conventional concrete. Due to this cohesiveness, slumps 25 to 50 mm (1 to 2 in.) higher than normal should be used for similar types of placement. For ease of placement, the highest practical slump (attained through the use of superplasticizers) should be specified. Despite the increased cohesiveness, microsilica fume concrete produces a very creamy paste and is very pumpable. One of the biggest differences in using microsilica in concrete occurs during finishing. The addition of microsilica will virtually eliminate bleed water, making it more susceptible than conventional concrete to plastic shrinkage cracking. Practices outlined in the Guide for Concrete Floor and Slab Construction (ACI 302) and Hot Weather Concreting (ACI 305) should be followed to provide a good surface. Microsilica is typically specified in dosages expressed by weight of cement. Dosages will vary depending on the application and the level of protection required, and typically range between 5% and 15% microsilica by weight of cement. These benefits make microsilica concrete suitable for a number of applications, ranging from structural beams and columns, to parking garage and marine structures, to chemical plant slabs, to dam spillways. These benefits and applications will be topics of future Engineering Bulletins. 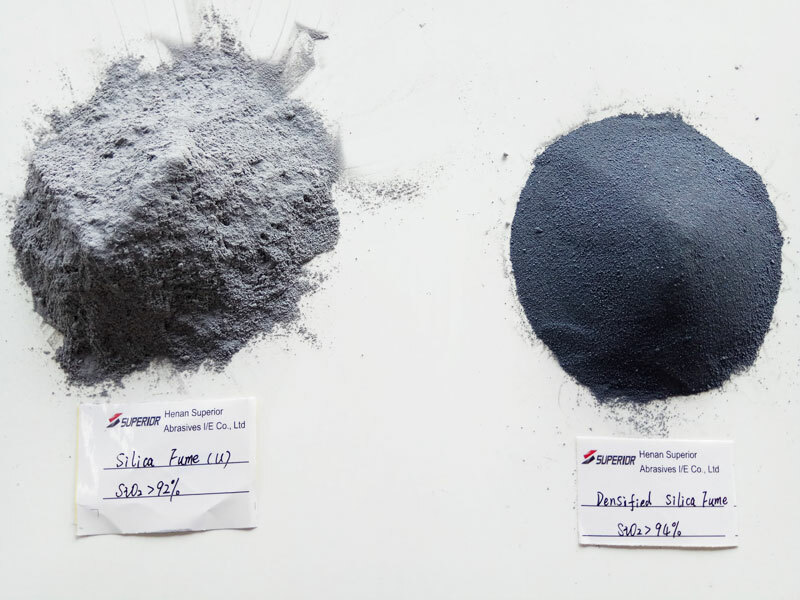 Henan Superior Abrasives I/E Co., Ltd is one of the largest Silica Fume Suppliers in China, Our market covers Australia, America, Canada, Mid-east, Russia, Spain, South Africa, Southeast Asia and etc. If you want to ask for microsilica in concrete ppt or have any questions, please contact us by E-mail gaom@superior-abrasives.com or leave your message on the following form, we will reply you soon, thank you.